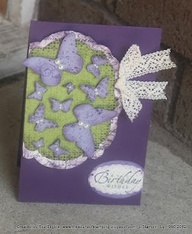 It was my Aunt's birthday last Friday so I had to send her a card in her favourite colour - purple! I was inspired by a wall scupture in a restaurant recently so took a photo of it. I thought something similar would make a lovely card front. This is gorgeous Roz - it has a real vintage look about it and I'm sure you're Aunty will love it.